This is a call for motivations from SA Primary schools to participate in this collaborative project with Level Up Village (LUV). They will train a SNSA trainer, who in turn will help the school with face to face workshops and encourage the school and teachers to complete the programme. This will help us prove a concept for further partnerships. What is the Level Up Village (LUV)? What is this partnership all about? Level Up Village (LUV) and SchoolNet SA will work together to implement three LUV courses in a South African public school. The school will be selected based on three criteria: (Wifi access, technology infrastructure, and enthusiasm for the project). Identify and address potential obstacles to successful large-scale future implementation. Evaluate the value of the courses to South African schools, students and teachers. Create a data set to help build courses and training to increase effectiveness in future implementation. The pilot will be implemented from March to June of 2017, with training and recruitment beginning as soon as possible, and course implementation beginning in April of 2017. Training will be conducted online by LUV staff and in-person by a SchoolNet staff trainer. Both LUV staff and the SchoolNet trainer will work with the public school teachers and public school staff throughout the training phase and actual course implementation. Who will be selected from the applicants? Supplies for Global Inventors course including 3D printer - if there are problems with supply availability for this class a substitution will be made. (Note: SchoolNet is still waiting to hear whether the school will receive a 3D printer, whether they need to have/purchase one, or whether the course could be substituted if they don’t have one. What is the benefit to learners? a. Understanding of the STEM subject of each class. b. Improved critical thinking skills including specific thinking skills in each class. c. Increased confidence in their abilities in the STEM subjects. d. Improved leadership and collaborative skills. e. Understanding of a different culture and country. What is the benefit to teachers? The courses will be implemented over a nine week period. The first two meetings will be focused on introducing students to the virtual collaboration and communication element of the course. After the initial two lessons, the course will follow the standard LUV course structure. In this course students learn how to code websites and work with their global partners to design and publish a social awareness website on the theme of global climate change. In this course, students learn how to build video games and animations using MIT's Scratch platform. Together with their Global Partner student, they create and share animations, co-design video games games and learn about each other in the process! In this course, students collaborate with Global Partner students who often lack reliable access to electricity. Together, they design and build solar-powered flashlights by harnessing the power of 3D printing and renewable energy tech! Windows PC (Win7 or better) with 8GB RAM or better, i5 CPU or better, 720p video camera (internal or external) or better. ChromeBook with Chrome 51 or better. Mac (MAC OS X10.9 - Mavericks or better) with 8GB RAM or better, 720p video camera (Internal or external) or better. iPad 2 or better with IOS9.x or better. iPhone 5 or better with IOS9.x or better. Android Tablet or Phone with OS 5.0 (Lollipop) or better. Chrome 51.x or better and must have Flash enabled. Note: No other browser is tested or supported. The teacher portal can only be run on a PC or MAC - mobile devices are not supported. Note : we test the above browsers - other browsers might work but we cannot guarantee all functionality. 2MBps download and 1MBps upload speeds or better. Connections should be on fibre, cable, DSL, or 4G/LTE wireless. Satellite connections are not recommended. 802.11G or better in the classroom connecting directly to the ISP. Students devices should have direct access to this WIFI hotspot. If your school is interested, please send a short motivation including how you meet the requirements below. 1. Staff desire and openness to the project. http://www.levelupvillage.com/ to find out more about LUV. This is another guest post from Peter De Lisle from Hilton College in Kwazulu-Natal. Peter is one of our Microsoft 2016/2017 MIEExperts from South Africa. Every so often Peter shares a great blog post on the SchoolNet blog.with his last one being 'Don’t just collect data – ask it a question (Using Excel Forms and Pivot Tables to conduct a meaningful survey)' and prior to that OneNote with the 16 habits of mind'. 3. Develop some writing skills in moving from a structure of ideas to its linear representation. David Christian and the Big History movement point to the importance of language, and in particular reading and writing, as a way for our species to do what no other species has managed: to be able to transmit what has been learned in one generation to the next, as opposed to relying on instinct. However, she starts her book on the reading brain with these words: “We were never born to read.” She goes on to delve into the neuroscience of why it is so difficult to read, and why so many people battle to master this fundamental skill. In contrast, there is a general perception that reading is easy, and that it is something everyone should “just pick up”. This can easily feed into a Fixed Mindset (“I really ought to be able to do this, so I better fake it”) instead of a Growth Mindset (“This is difficult, so I must devote myself to mastering it”) (see the writings of Carol Dweck). The Fixed Mindset problem is further exacerbated by the focus on the teaching of literature in English classes. Most English teachers studied literature in their degrees, and so fall back on this, rather than developing expertise in teaching reading and writing. Literature is easy because it is a “story”, and does not follow the rules of most other writing. Of course, serious writers layer their work with deeper meanings and complex themes, and university people study these and make it even more complex. But everyday people read everyday stories and find them relatively easy. The basic structure of a narrative (a linear sequence of events) fits well with the way we write (a linear sequence of words). That is why reading stories is fairly easy. In contrast, one of the key problems in reading for information is that it is a structure of inter-related ideas, not a linear sequence. It is only represented in this limited way. So the trick when reading is to decode the linear, and understand the structure. The trick when writing is the opposite: to encode the structure in a linear format. If you are old enough, here is a metaphor: it is like trying to find a song on a cassette tape versus on a CD. The tape is linear, and has no structure, but the song is there somewhere; you just can’t find it. The CD is well structured, and so, by referring to the CD cover, you can easily skip to your favourite track. When you read, you are converting the text from “tape” to “CD”. 1. Introduce the idea that reading is difficult for everyone; that it is something that gets better with practice. Link to Growth Mindset if possible. 2. 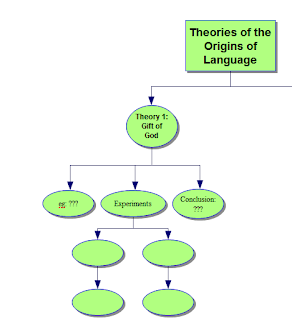 Display and invite students to view the document “Origins of Language”. Tell them they have 2 minutes to study it for a test. After a short time (less than 2 minutes) let them off the hook, and debrief why it was so difficult. You could prompt by asking “: What is missing that makes it difficult?” Answer: a title/heading; paragraph breaks. 3. Ask students to skim the first couple of lines, and then ask them to provide a title; (Where does language come from? ); also ask how many paragraphs there should be. “There are 3 theories…” So 3 paragraphs, plus introduction and conclusion = 5. 4. Follow up by asking what we would expect to find in those paragraphs. Each paragraph describes a different theory. 5. PAUSE/REFLECT - what we have learned so far: (1) paragraphs are important for finding meaning; (2) it is important to “guess ahead” – predict what is coming up using whatever clues you can (NB this is not a mystery novel where the outcome is kept secret!). · OK, now we need to put the paragraph breaks back in. Invite students to use the find (Ctrl-F) function to search for “First theory”, and put the paragraph break into the text at the beginning of that sentence. And they can surely figure out what to do next. 6. When the students have put all the paragraph breaks back in, give them 30 seconds to find what the 3 theories are. Answers: 1 – Gift of God; 2 – natural Sounds; 3 – Evolutionary changes. Follow up – How did they find these? Answer – each paragraph has a topic sentence which is an introduction to the paragraph. What does each mean? Invite the students to make some guesses without reading the paragraphs. 7. PAUSE/REFLECT - what we have learned so far: (1) a paragraph is information related to ONE idea; (2) well written paragraphs have a topic sentence; (3) to get a quick summary of a text, skim the topic sentences of each paragraph; (4) it is a good idea to do this before reading a passage so as to get a “map” to guide detailed reading. 8. Students can now close this document. 9. SWITCH APPLICATION – as students to open the mindmapping tool which you use – Inspiration/Webspiration if you have it or Mindmeister. The next phase is to find the information which will be used to fill in the detail on the mindmap; ie finding the supporting information for each of the 3 theories. 1. 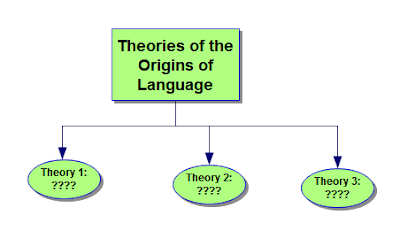 Open the document entitled “Origins of Language – Clues”; note the text has been doctored to indicate the clues which can help to understand the structure. Explain to the students that when we read, we are looking for two kinds of information – KEY WORDS (orange) which indicate the ideas and information we need to grasp; STRUCTURE words (blue) which indicate the way we need to read those key words – ie how they relate to each other and the overall text. Basically, all the details within a paragraph tell us more about the main idea of that paragraph – explanations, examples, extra details. The black words are less important and should only be used to clarify the others if necessary. 2. PAUSE/REFLECT – not all words are of equal value or function. Good readers do not read every word, and do not read the words they do read in the same way. 4. Take it step by step, trying to use only the blue and orange words. 5. “For example” – (blue) a structure clue; this tells us that what is comping up is “just” an example. 6. The example – “Adam” (orange) named the animals somehow that became their “built-in” name. Maybe students can come up with other examples? Eg Where does the word “Mama” come from? Why do people all over the world use that word for mother? 7. Discuss – if you have a theory, and you want to prove it, what do you do? Answer – test it. OK, how would you test the theory that language is somehow built in to humans? Discuss. Answer – somehow deprive a child of human language contact. Think of an example from literature/movies. (answer – Mowgli in the Jungle Book). 8.“Experiments” (blue – it provides structure of what is to come) – testing the theory. 9. There were two experiments – who conducted the first one? What did he find? 10. Who conducted the second one? What was their finding? 11. The last sentence is a conclusion, introduced by “so” (blue). What is the conclusion? 12. Display this update to the mindmap, and ask the students to fill in the ???? and blank bubbles on their mindmap. 1. PAUSE/REFLECT: Reading is complicated; one could probably get a general grasp of the ideas in this paragraph, but by reading it properly, one understands exactly what is going on. When poor readers read, they tend to grasp at any details they can in the linear sequence; so in this paragraph, they might remember the name of King James IV of Scotland, but not understand why he is important (or not). If they went into a test feeling they had studied hard, but only remembering random bits of unrelated information, they might emerge from the test saying, “I studied so hard, and somehow I just didn’t know what was going on”. This is particularly the case if the study “method” is just to keep on reading and re-reading the text. There are 170 words (in a linear sequence) in this paragraph alone (show students how to highlight and see the number of words displayed in the status bar); but there are only 8 items in the mindmap. Which is easier to remember? Obviously the mindmap, especially if you read it from top to bottom – the higher up items make sense of and suggest the lower ones. Eg if you remember the keyword “experiments”, it helps you find your way to the two experiments and their results, and the conclusion. There is a logical progression to the ideas which is embedded in the structure. 2. Invite students to work on the paragraphs containing the second and third theories. Look closely at the topic sentence and the other introductory sentences. In both cases there is a trick to understanding these paragraphs. 3. 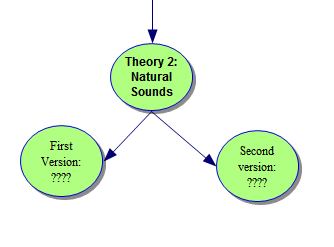 Natural sounds – “There are two versions of this theory” – (blue) this alerts us to the fact that the paragraph has two sections, the first version and the second version. So the mindmap needs to branch. Each version follows the same pattern – example(s) and problem(s). And finally there is a conclusion. 4. 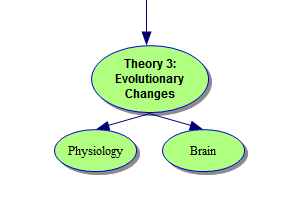 Evolutionary changes – this paragraph also splits into two: physiology and brain. For each there are then examples. There is a problem which applies to both. Finally there is an overall conclusion to the paragraph. One of Word’s most powerful features for organising structuring ideas is Outlining. This tool makes it easy to work with text in such a way that it becomes a structure of ideas rather than a sequence of words. Lesson 2 in the next blog post will look at how to use this tool, and provide some practice exercises. 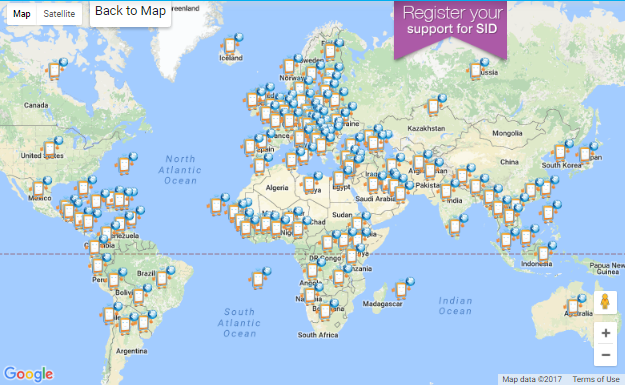 On Thursday afternoon 23 February 2017 at 3:30pm, Allan Hart, a teacher at Appelby Preparatory in Elgin presented a webinar about his use of Skype in the classroom. His aim was to encourage teachers to use the free online video tool, Skype, in their classrooms this year. One of the ways of doing this has become known as Mystery Skype. This is an interactive learning game where two classrooms use Skype and a series of questions to guess each other’s locations and find out more about each other. It is suitable for all ages, and gives kids an interactive way to build skills one question at a time. In this webinar Allan talked about his experiences using Skype in the classroom. He discussed the benefits of using Skype from an education point of view. Allan also explained how educators can become Skype-ready and how to collaborate with other schools from across the globe. After explaining how a Mystery Skype works, Allan demonstrated how to find educators to link with for Mystery Skypes using the Microsoft Educator Community. The webinar recording can be listened to on the following link on YouTube: http://bit.ly/2jN8Wr8 or it can be viewed in the embedded video below. We are pleased to announce that our next free webinar, Using Skype in the Classroom will be held on Thursday 23 February at 3:30pm. Our speaker will be Allan Hart, a teacher at Appelby Preparatory in Elgin who will be talking about his use of Skype in the classroom. We would like to encourage you to use the free online video tool, Skype, in your classroom this year. 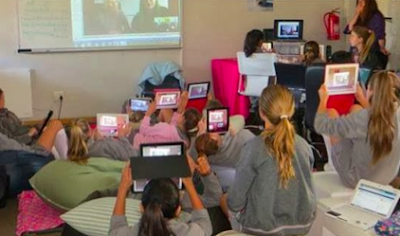 One of the ways of doing this has become known as Mystery Skype. This is an interactive learning game where two classrooms use Skype and a series of questions to guess each other’s locations and find out more about each other. It is suitable for all ages, and gives kids an interactive way to build skills one question at a time. We will be using the Adobe Connect webinar platform for the webinar. Please join us as we hear about how Allan Hart uses Skype in his classroom. Summary: Allan Hart from Applewood Preparatory will talk about his experiences using Skype in the classroom. He will be talking about the benefits of using Skype from an education point of view. Allan will explain how educators can become Skype-ready and how to collaborate with other schools from across the globe. He will explain how a Mystery Skype works. 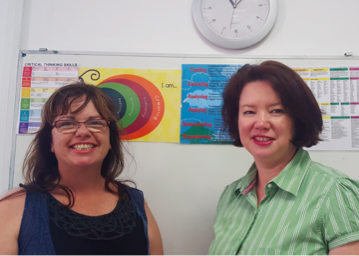 Judi focuses on teach critical thinking skills in her ICT lessons. “Once I had researched more about how and why to incorporate critical thinking more regularly using Microsoft tools, I was convinced that I was on the right track. We are teaching 21 century children, so we need to teach them 21 century skills.” Critical thinking skills are spread across 6 levels, and generally teachers tend to focus on the 1st three too often: knowledge, comprehension and application. So Judi now includes the next 3 levels: analysis, synthesis and evaluation in her lessons. Critical thinking skills fit hand in glove with Bloom’s taxonomy and blended learning. Do you know about Microsoft’s Digital civility pledge to help create a safer, more civil Internet? Will you take the Digital Challenge? Live the Golden Rule. I will act with empathy, compassion and kindness in every interaction, and treat everyone I connect with online with dignity and respect. Respect differences. I will appreciate cultural differences and honor diverse perspectives. When I disagree, I will engage thoughtfully and avoid name calling and personal attacks. Pause before replying. I will pause and think before responding to things I disagree with. I will not post or send anything that could hurt someone else, damage my reputation, or threaten my safety or the safety of others. Stand up for myself and others. I will tell someone if I feel unsafe, offer support to those who are targets of online abuse or cruelty, report activity that threatens anyone’s safety, and preserve evidence of inappropriate or unsafe behaviour. 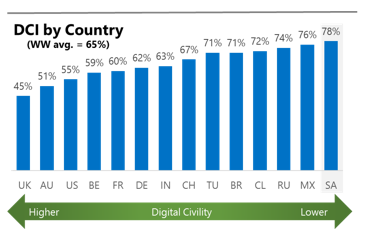 How does South Africa fare when it comes to ‘digital civility’? Contributing to this poor result is the fact that 78% of participants surveyed reported having been exposed to an online risk, which exceeds the international averages for both Intrusive and behavioural risks. Moreover, South Africans encountered reputational risks more often than international (22% vs. 18%) and this is led by doxing (14%) and damage to personal reputation (11%). Doxing is the practice or researching and then broadcasting private information about someone online. Over seven in ten South Africans reported a consequence from exposure to an online risk. This was slightly higher than the international average. In general, the top ten consequences were experienced at the same or higher levels in South Africa compared to international. As a result people become less trusting of others. Whose responsibility is Digital Civility? 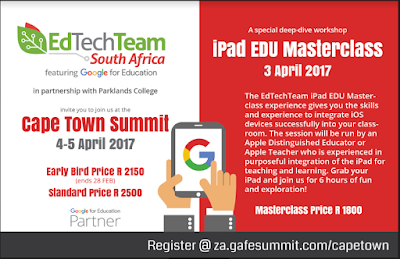 Three EdTechTeam South Africa Summits featuring Google in Education this year – which one will you attend? 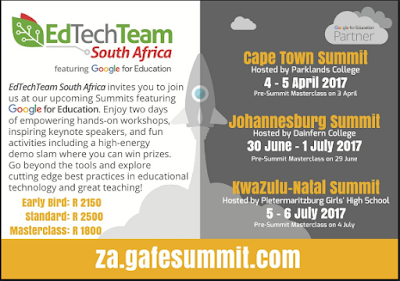 Every year for the past few years the EdTechTeam based in the United States has held a very successful Summit featuring Google for Education in South Africa. 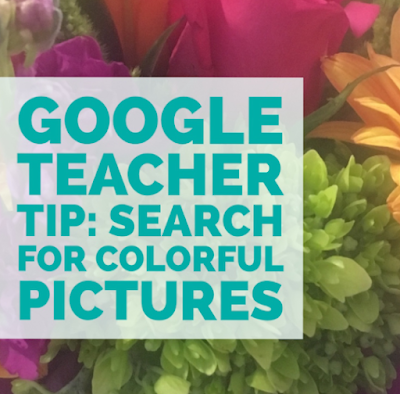 These have always been incredibly inspiring events where teachers go home with a myriad of exciting classroom ideas. This year THREE of these summits are planned for South Africa in different areas. 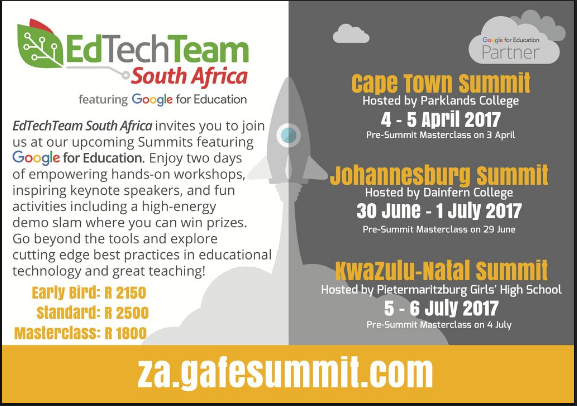 EdTechTeam South Africa invites you to join them at their upcoming Summits featuring Google for Education. Enjoy two days of empowering hands-on workshops, inspiring keynote speakers, and fun activities including a high-energy demo slam where you can win prizes. Go beyond the tools and explore cutting edge best practices in educational technology and great teaching! Workshops are going to be led by Google Certified Innovators, Google for Education Trainers, Apple Distinguished Educators, school leadership or teachers with a passion to share their work to help others raise their game as well. Register now to send teachers, administrators, tech directors, library media specialists, tech support staff, and anyone who is interested in finding out more about leveraging G Suite from Google for Education and iOS to support student learning. Richard says, "We have negotiated lower pricing so that you can enjoy two days of empowering hands-on breakout sessions, inspiring keynote speakers, and fun activities including a high-energy demo slam. 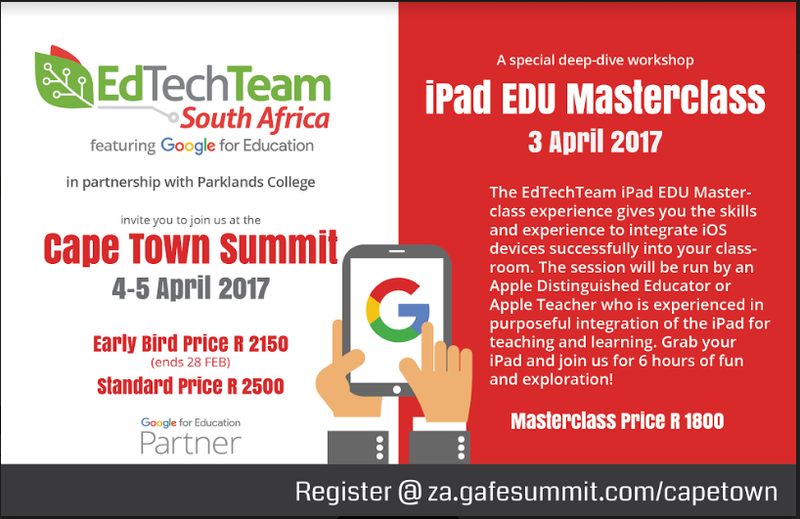 Register for the two day Summit event to take advantage of the early bird pricing here: http://za.gafesummit.com/capetown"
This one-day experience is designed to inform, inspire, and empower educators. Workshops include sessions for leaders, educators, and technical staff. Coffee and lunch are provided for all ticketed workshops. KwaZulu Natal teachers participating in the Telkom Connected Schools Project have been an awesome group to work with and this is mainly attributed to the change in thinking by the school management teams. 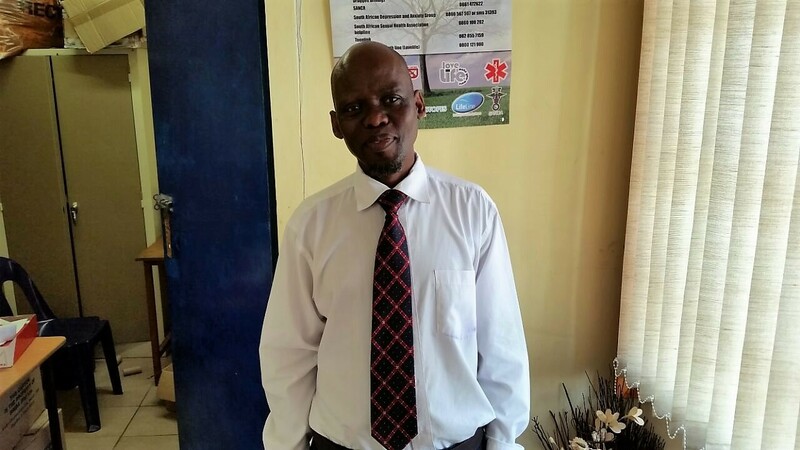 This month’s spotlight is on the enthusiastic Mr J.E Khumalo, the principal of Habeni Primary School who is also the Social Science teacher at the school. Mr Khumalo reports that being part of SchoolNet’s Change Leadership in ICT Integration program has helped him immensely as it has helped him realise that leadership is not about working in isolation but that is it more about sharing the workload with his team, where delegation does not mean abdication of responsibility. His senior management team has learnt that much is achievable when the school has a shared vision which pushes all stakeholders to work towards achieving the same goal for the school community. In the six months of Change Leadership for ICT Integration training has taken place, the SMT members have gained confidence in their leadership skills and are now more actively involved in the management of the school. For a number of years, Mr Chinsammy was the only teacher who had the skills to create mark sheets and use computers effectively and this caused teachers to constantly require assistance from him and this in turn created an additional burden on him. Habeni teachers attended Intel’s Getting Started and since then things changed; teachers have become independent and are creating mark sheets, typing exam papers and creating lessons using PowerPoints. Some teachers are now also exploring Encarta for offline research. Mr Khumalo who also attended the ICT skills training said “I used to write all my question papers by hand then make copies for learners but now I type ALL my documents and this saves me a lot of time. I still struggle a little with PowerPoint but I am not worried because I attend after school computer lessons with my colleagues and I know that in time I will get it right.” The teachers at the school practice their newly learnt skills daily and sometimes work till late in the afternoon because practicing these skills can be fun! Using Encarta excites Mr Khumalo. He reports that his learners love the fact that they are not limited to their text books for learning. They are now able to do research in class for projects and learning has become practical. Learners watch Social Science experiments, short videos and find pictures of which makes learning much more meaningful. 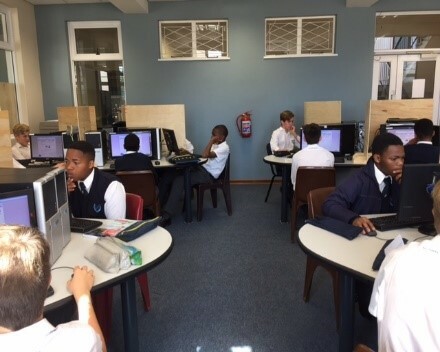 Looking into the future, Mr Khumalo says that he would like his school to have internet access so that his teachers can prepare and present more exciting lessons and allow learners the opportunity access more learning resources. 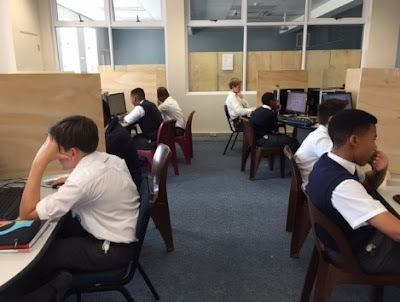 His ideal school is one where each of his learners has access to a connected laptop or tablet throughout the day. “This project requires a lot of time from us, and it is all worthwhile. This is personal and professional development that helps us go beyond our call of duty to help our learners be hopeful of a better future” Mr Khumalo can’t seem to express in words the joy and fulfilment that the Telkom Connected School project has brought to the school and he encourages all teachers to be actively involved when opportunities like these arise. Educator Spotlight #4: Erika Esterhuizen – Have you discovered SharePoint? Erika describes herself as “a natural leader where problem solving, and decision making skills are part of my personality.” She is currently employed by St Andrews College in Grahamstown, South Africa, as Head of Department: Information Technology. Her motivation in education is based on ICT integration opportunities and using these to make teacher, parent and learners daily tasks easier. In 2016 Erika won the coveted ‘ISPA 2016 TechTeacher of the Year ‘ award presented by the CoZa Foundation. 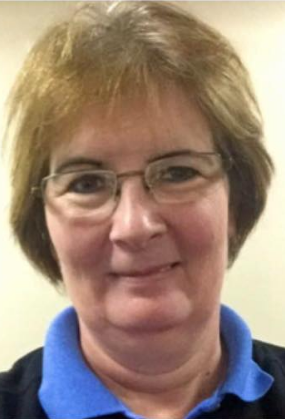 Erika says “It is my passionate belief that the use of technology in any career changes lives, families, communities and ultimately, nations.” Erika has also been exploring the use of Microsoft SharePoint. Are you wondering what SharePoint is all about? Erika says “I enjoy exploring the potential of Microsoft’s Sharepoint. 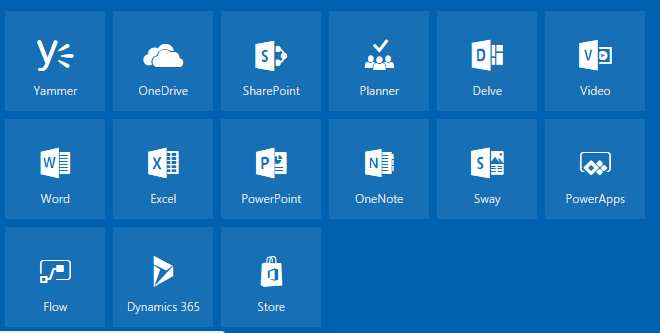 SharePoint is a place for running daily workflows and processes, which I am still learning and exploring. SharePoint is not a single tool, but rather a platform that enables a lot of different educational activities.” Microsoft SharePoint is a browser-based collaboration and document management platform It is Microsoft's content management system. It allows groups to set up a centralized, password protected space for document sharing. It is not a program, it is a platform. It is a server product. You don’t install it because it is not a program. You connect to it. It has six different areas namely sies, composites, communities, insights, content and search. It makes sites. It gives you a place to put your content instead of putting it into local folders. It lets you search itself. It gives insights to bringing the information together. When you open Office 365 you’ll notice the link to SharePoint as shown in the image above. Erika started using SharePoint about a year ago and has described it as 'a never ending learning curve'. Currently she uses it mostly for document sharing and collaboration. If you are a teacher looking to collaborate and communicate with your students, in class and beyond SharePoint could be just what you are looking for. Here is a Microsoft Virtual Academy video entitlled 'SharePoint for Your Classroom' http://bit.ly/2ka2bzP featuring Sonja Delafosse from Microsoft. Announcements: this enables teachers to post important information, for example reminders about tests and assignments. Class discussion: similar to an online forum, students are able to post questions or participate in discussions. Links: teachers can post links to useful websites. Class documents: the document library feature allows teachers to upload classroom resources for example worksheets, assignments, videos and much more. Course syllabus: the list feature in SharePoint allows us to create and customise columns containing different types of information. In this example, teachers are able to post information about the course syllabus. Calendar: here teachers are able to post important event information for example test, assignment and exam due dates as well as to attach relevant information to the event, similar to Outlook. Think about exploring using Microsoft SharePoint in some of these ways this year.